An international team of astronomers studying 200,000 galaxies has measured the energy generated within a large portion of space more precisely than ever before, discovering that it’s only half what it was 2 billion years ago and fading – the Universe is slowly dying. 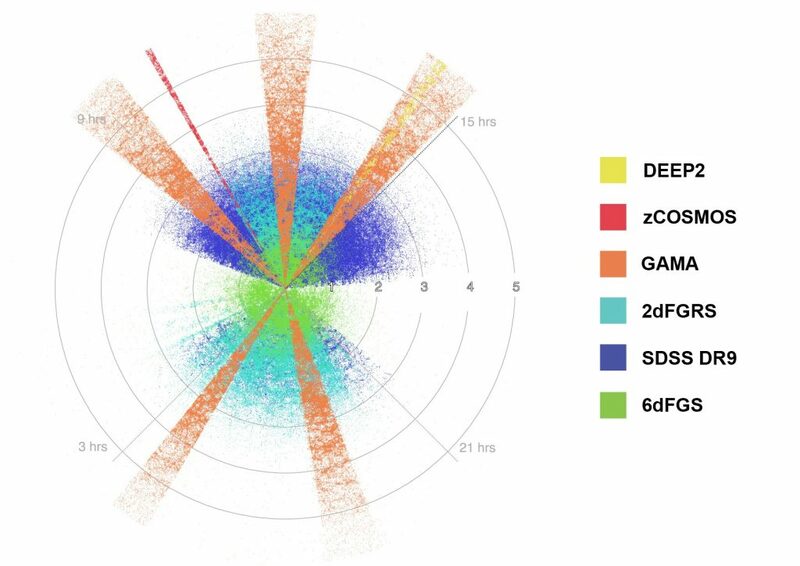 Researchers from the International Centre for Radio Astronomy Research (ICRAR) in Western Australia used seven of the world’s most powerful telescopes to observe galaxies at 21 different wavelengths from the far ultraviolet to the far infrared. 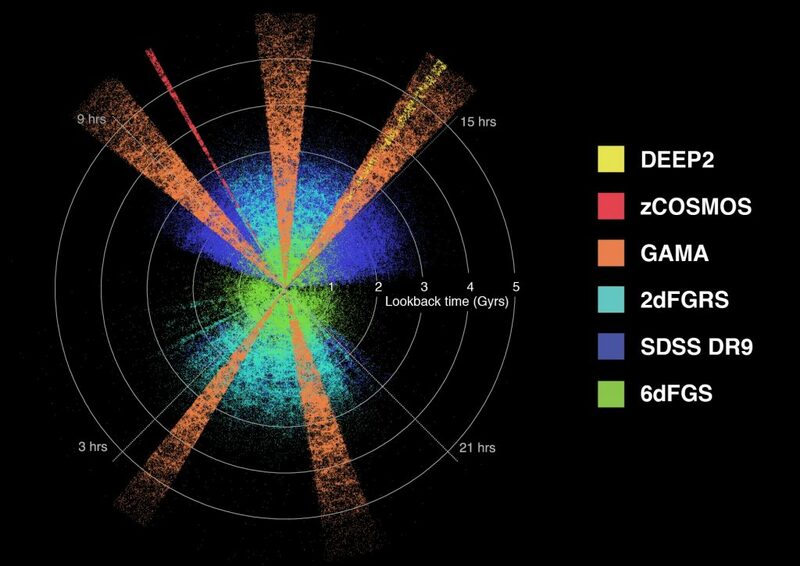 Initial observations were conducted using the Anglo-Australian Telescope in New South Wales and supporting observations were made by two orbiting space telescopes operated by NASA and another belonging to the European Space Agency. “We used as many space and ground-based telescopes we could get our hands on, to measure the energy output of over 200,000 galaxies across as broad a wavelength range as possible,” says ICRAR Professor Simon Driver, who presented the findings at the International Astronomical Union’s General Assembly in Honolulu. 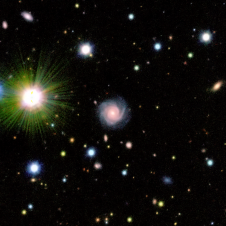 The survey data, released to astronomers around the world, includes 200,000 galaxies each measured at 21 wavelengths from the ultraviolet to the far infrared and will help scientists better understand how different types of galaxies form. Professor Driver, who heads up the GAMA team, says the study set out to map and model all of the energy generated within a set volume of space. All energy in the Universe was created in the Big Bang with some portion locked up as mass. Stars shine by converting this mass into energy as described by Einstein’s famous equation E=MC2. “While most of the energy sloshing around was created in the aftermath of the Big Bang, additional energy is constantly being released by stars as they fuse elements like hydrogen and helium together,” Professor Driver says. The fact that the Universe is slowly fading has been known since the late 1990s but this work shows that it’s happening across all wavelengths from the ultraviolet to the infrared, representing the most comprehensive assessment of the energy output of the nearby Universe. “The Universe is fated to decline from here on in, like an old age that lasts forever. The Universe has basically plonked itself down on the sofa, pulled up a blanket and is about to nod off for an eternal doze,” Professor Driver says. The team of researchers hope to expand the work to map energy production over the entire history of the Universe. To do this, they will use a swathe of new facilities including the world’s largest radio telescope, the Square Kilometre Array, due to be built in Australia and South Africa in the next decade. Professor Driver will present this work at the General Assembly of the International Astronomical Union in Honolulu on Monday, August 10. The Galaxy and Mass Assembly Survey, or GAMA, is a collaboration involving nearly 100 scientists from more than 30 universities located in Australia, Europe and the United States. The Galaxy and Mass Assembly catalogue is a detailed map of the Universe showing where galaxies are in 3D. 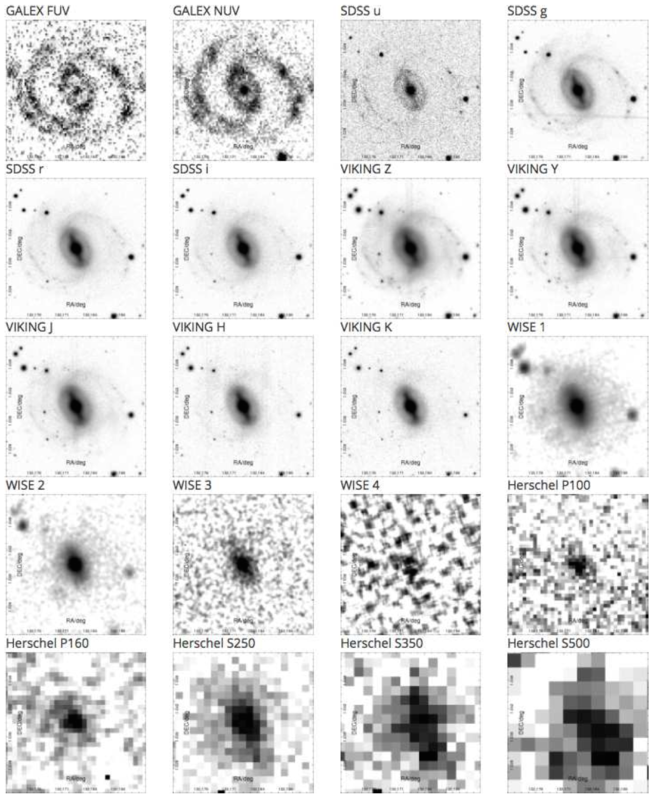 This simulated flythrough shows the real positions and images of the galaxies that have been mapped so far. Distances are to scale, but the galaxy images have been enlarged for your viewing pleasure. Credit: Made by Will Parr, Dr. Mark Swinbank and Dr. Peder Norberg (Durham University) using data from the SDSS and the GAMA surveys. This work was supported by the Ogden Trust, STFC and the Royal Society. The distribution of galaxies as mapped by various Australia, US and European survey teams. In total we have mapped the locations of over 4million galaxies that can be used to study the evolution of mass, energy and structure in the Universe over the past few billion years. Credit ICRAR / GAMA. A galaxy from the GAMA survey observed at 20 different wavelengths from the far ultraviolet to the far infrared. Credit: ICRAR / GAMA. 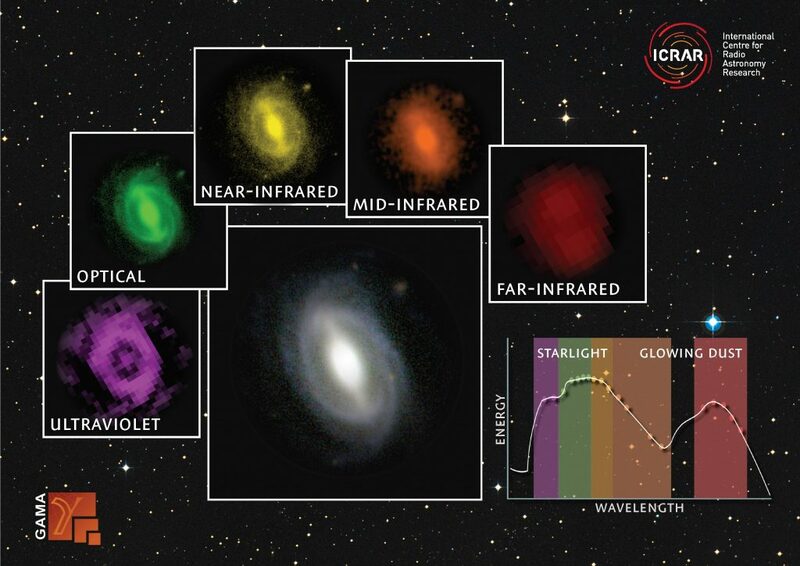 A galaxy from the GAMA survey observed at different wavelengths from the far ultraviolet to the far infrared. Credit: ICRAR / GAMA. 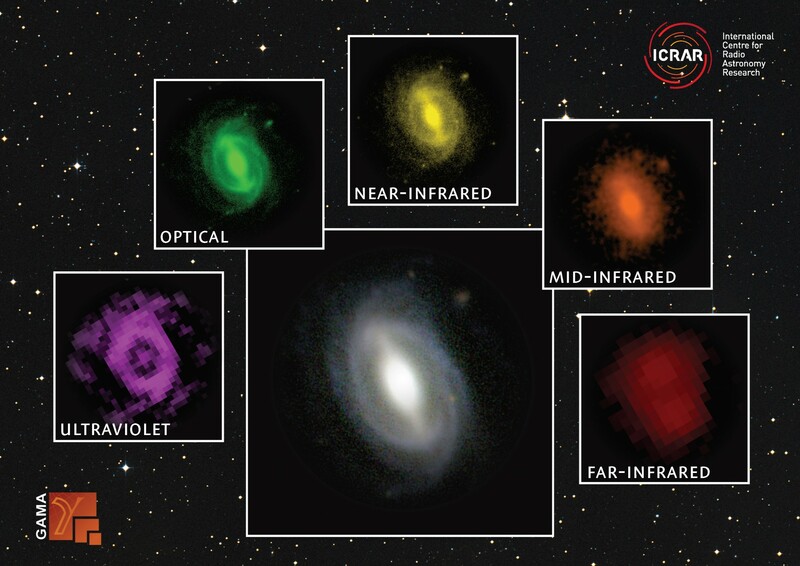 A galaxy from the GAMA survey observed at different wavelengths from the far ultraviolet to the far infrared. The inset graph shows how much energy is being generated at the different wavelengths. 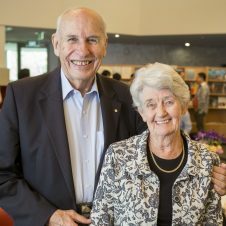 Credit: ICRAR / GAMA.